Today I just sat wondering why white chocolate is called chocolate yet it doesn’t have any chocolate in it. But then I also wondered, what is chocolate, really? Unsweetened, pure or bitter chocolate is basically the mass extracted from ground, roasted cocoa beans (also known as cocoa liqueur) and is made up of cocoa powder and cocoa butter in varying proportions. Cocoa butter, also known as theobroma oil, is a highly stable vegetable fat that remains solid at room temperature but melts at temperatures of around 34–38 °C (93–100 °F). It has a shelf life of up to five years. ‘White chocolate’ is basically made of cocoa butter blended with sugar, milk and flavouring and many countries do not consider white chocolate a chocolate. I tried to find out what these countries call it, but I couldn’t trace anything. If I do, I shall update this paragraph. Sugar can be added to bitter chocolate to produce sweetened chocolate and milk can be further added to produce milk chocolate. The cocoa content of commercial chocolate bars range from 30% (sweet) to 80% for extremely dark bars and are distinguished by terms such as bittersweet, semi-sweet, and sweet. 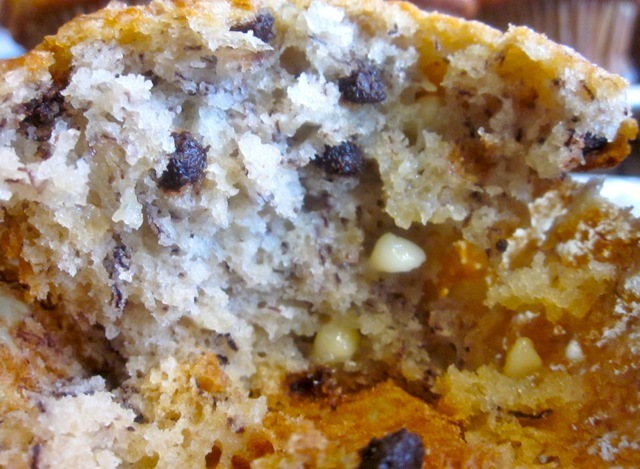 Today I want to share with you a simple recipe for chocolate banana muffins. I added white and dark chocolate to it and it tastes so good, I have no words to describe it. You have to taste it to know exactly what I mean. So here we go, the recipe for chocolate banana muffins. Please remember to assemble all ingredients before you start baking. 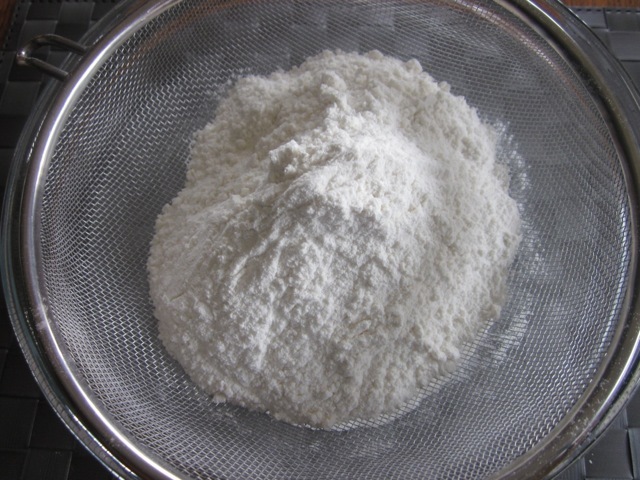 Sift flour, baking soda (bicarbonate of Soda) and baking powder (and salt if using). 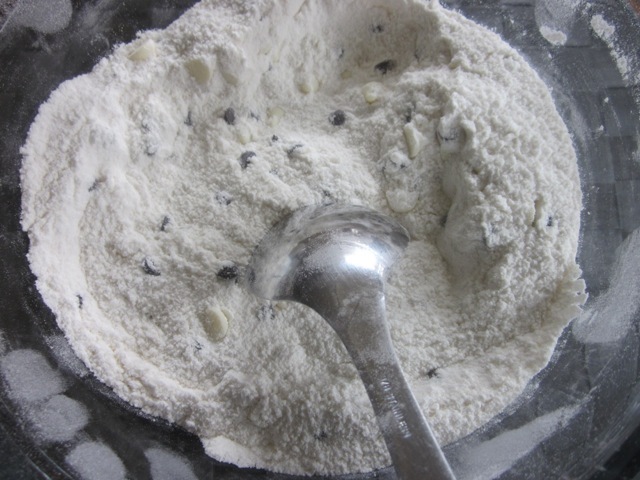 Add sugar and chocolate chips to the flour. 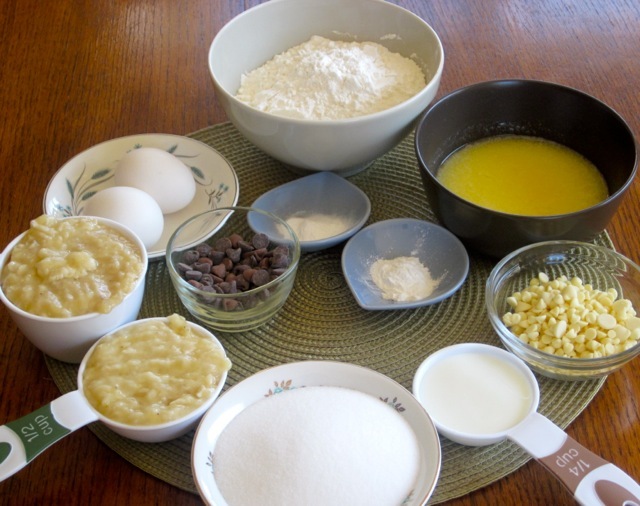 Spoon mixture evenly into 14 paper cases and bake at 400°F (200°c) for 20-25 minutes or until a toothpick inserted into the centre of the muffins, comes out clean. I baked 22 minutes. We enjoyed them, hope you do too!!! Preheat oven to 400°F (200°C) or 375°F (190°C), Convection. Line 2 medium, muffin tins (pans) with paper cases. 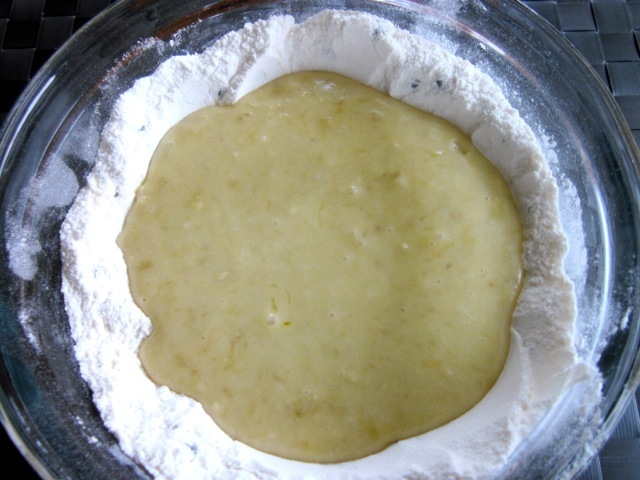 Sift the flour, baking soda (bicarbonate of Soda) and baking powder (and salt if using). 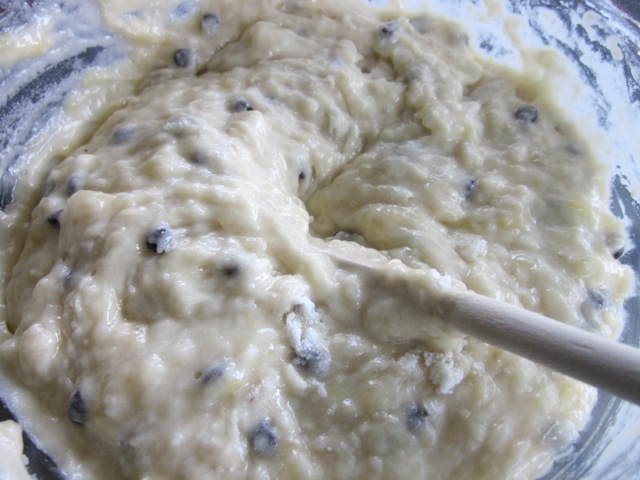 Add the sugar and chocolate chips. 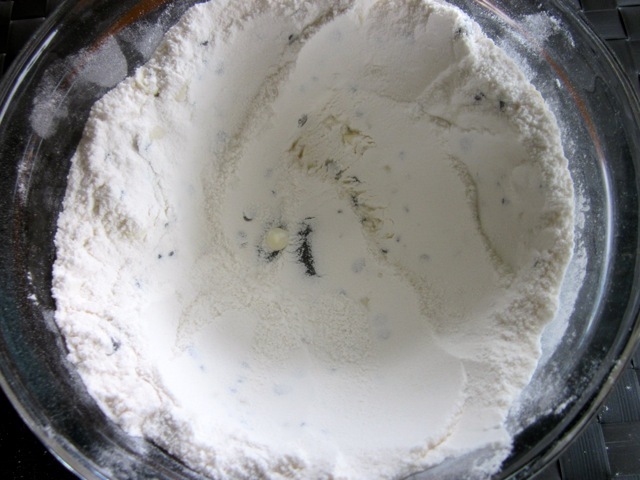 Mix thoroughly and make a well in the centre. 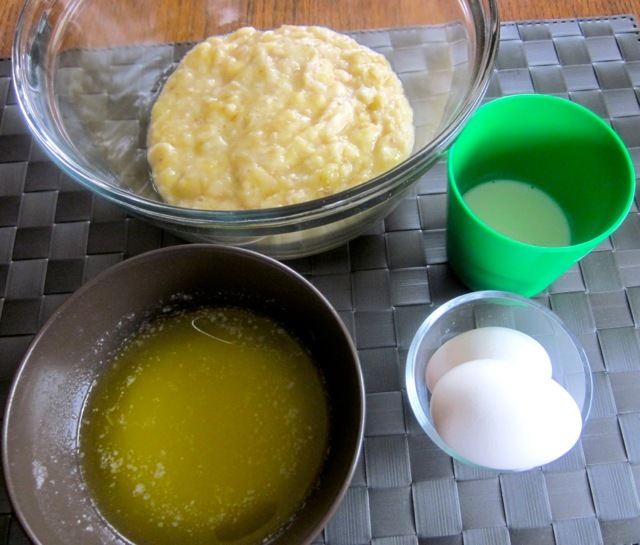 In separate bowl, beat the eggs, mashed banana, melted butter and buttermilk until thoroughly mixed. 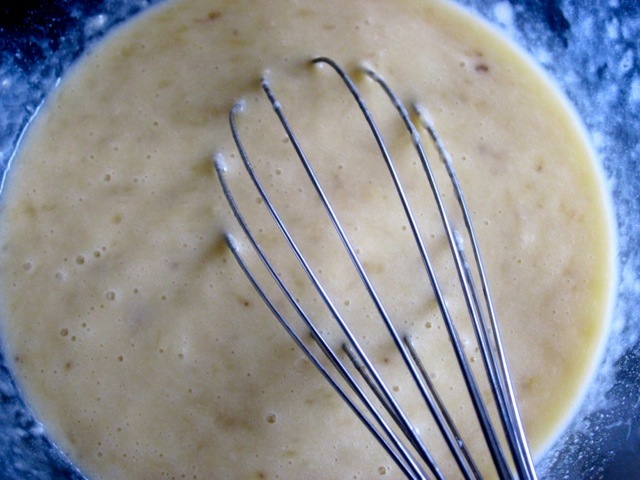 Add the banana mixture to the well, stir until combined (do not over mix). Spoon mixture evenly into the prepared tins and bake 20-25 minutes or until a toothpick inserted into the centre comes out clean. The Brook Cook Click here to see her version made with whole wheat flour. I hope you enjoy the muffins, please let me know how it turns out for you. Thank you for liking many of my posts. Have a wonderful weekend! Just printed out the receipe & it should not take 34 pages to do so, not printer friendly!! I am so sorry about that, my blog is only four months old and I’m still working on many things. Right now you have to indicate the actual page you want to print, before printing. I am trying to work out a more user friendly way of printing recipes with ease. It will take a few days to one week so I hope the next time you try to print, it will be a much better experience. Thanks for pointing out the problem. I hope that will not deter you from coming back to this blog. You are always welcome. Have a lovely day and a pleasant week!! Hi, again :). 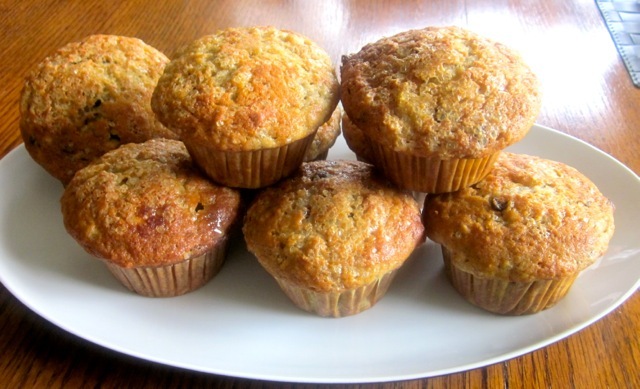 I made these tasty muffins and posted a link to your blog- you might want to check it out. Thanks so much for making the muffins. You’ve made my day. I shall indicate at the end of the post that you made them, with a link. Have a great week!!! I shall be browsing your blog to see what I can make too…in the coming days. Thanks so much for trying out the muffins. Sometimes I also make them with a bit of wholewheat flour. I love them though and make them once a week, because I buy a lot of bananas and there is always some left-overs at the end of the week. I also make a banana bread (I have not posted it, yet) but this is also one of our family favourites too. Thanks so much-“The goal of this blog is to inspire you and me to cook/bake” so if you are inspired then my goal is being met. Thanks you’ve made my day. Wish you a wonderful week!! Yum! I have super ripe bananas on my counter screaming to be made into muffins right now! Do you know it takes less than 20 minutes to whip up muffins? Please go ahead and use those bananas before they end up in the bin. Thanks for visiting, have a good day and a splendid weekend!!!!! I made these and after tasting one, there was no going back. 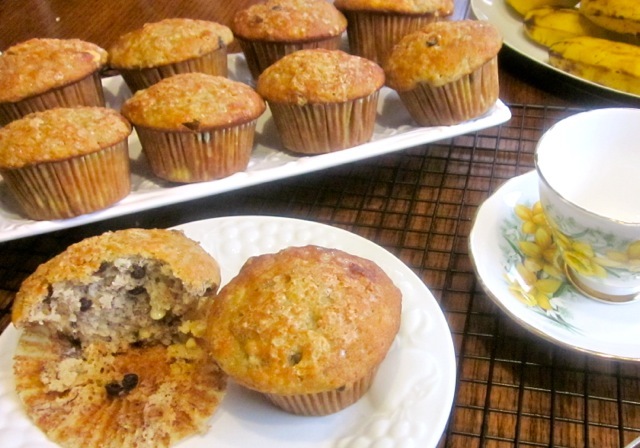 I absolutely loved the banana in a muffin ( a great idea by the way ) and the white and milk chocolate chips. It was heaven in my mouth. Definetely going to be making these a whole lot more! Thanks so much for trying out the muffins, you have made my day. I absolutely love them too, especially the blend of white-dark chocolate. It tastes delicious. I am so glad to see you after some silence, hope to see more of you in future. Have a fantastic weekend!! They are very tasty, you must try them, if you can. Thanks for stopping by and thanks for liking many of my posts. Regards to Hari, he’s my friend too!!! The secret never stock something you overeat. I have the same problem with nuts, I just make sure I never keep nuts in the house however much I crave and yearn for them!!! Have a lovely day!!! These look yummy! I too love white chocolate and dark chocolate together. 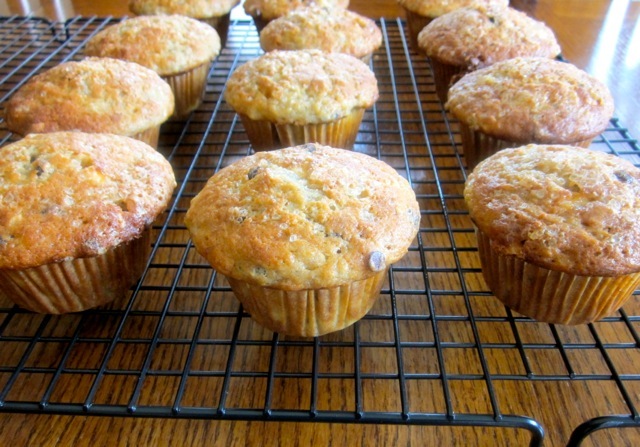 I make a similar muffin, banana coconut chocolate chip. Will definitely need to try these. Hey Liz here is some info I found on white chocolate (you may or may not know). Info found at various websites. True White Chocolate (as in all chocolate) contains cocoa butter, an extract from the same beans that the cocoa solids come from. The FDA actually has standards for what is allowed to be called chocolate. If you look on the FDA web site ( http://www.fda.gov ) and look up the technical specs by using the search terms “white chocolate”, “milk chocolate”, “bittersweet chocolate” or “semi sweet chocolate”, you’ll see the only real difference is between white, milk and dark chocolate is the amount of cocoa solids and percentages of other ingredients. The standards for white chocolate were created to separate it out from the lesser types of coatings and to get the USA in line with the worldwide standards. This way a company could not sell the cheaper stuff (without cocoa butter) and say it was “White Chocolate”, and the countries that had similar laws could sell their product here. There is some detail on the reasoning for this on the FDA web site in the “White chocolate” standards of ingredients. Some people who say they do not like “white chocolate” may never have tasted the real thing. Real white chocolate is rich and creamy and tastes like chocolate. 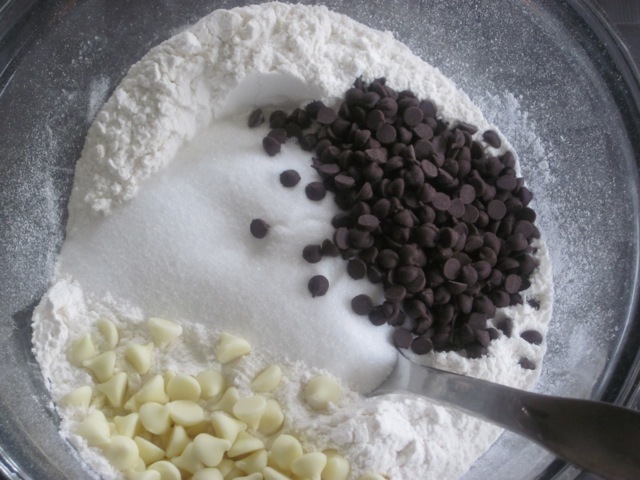 In addition to the minimum 20% cocoa butter, to be called white chocolate, the product must have a minimum of 15% milk powder and a maximum of 55% sweetener. Regular chocolate and white chocolate both come from the seeds of the cacao plant. Regular chocolate contains both the fat from the seeds (called “cocoa butter”) and the solids (called “cocoa”), and is often sweetened with sugar. White chocolate is cocoa butter combined with sugar. Most of the flavor of regular chocolate comes from the cocoa solids, but some of it also comes from the cocoa butter. White chocolate has only the flavor of the cocoa butter, which makes it faintly chocolate-like. Also one website stated to be careful on the white chocolate you buy as some try to sell it with vegetable fat and no cocoa butter. I love white chocolate too, I have a permanent supply of genuine white chocolate in my kitchen because I really love baking with it. It goes well with the dark one and combines to give an excellent flavour. Thanks so much for this detailed information. This is very useful. Have a wonderful week! Thanks so much for visiting my blog. Today I have learnt something new as well, Greek yogurt, does it work better than other yogurts? or are all yogurts just the same. Have a wonderful weekend! You KNOW I have a chocolate addiction damnit lol. (I actually read this a day ago and on my way in to work grabbed a banana chocolate chip scone because of this! lol. 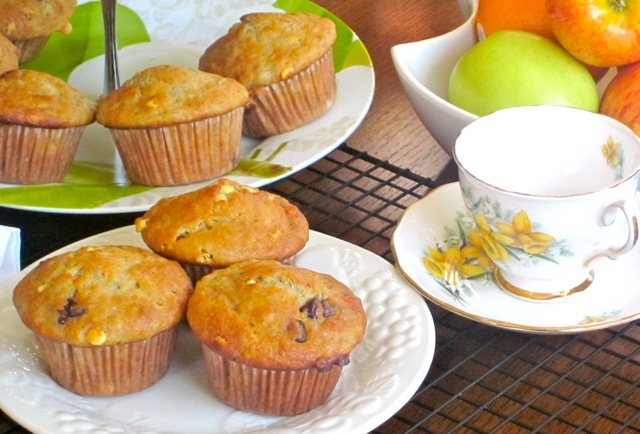 I have made banana choco muffins at home too. I have these shallow clay dishes…about 2 cm high, 10 cm in diameter…and I pour the batter in there similar to your muffin tin. But I have never tried it with white-I-know-its-not-really-chocolate-but-I-Really-don’t-care-Im-using-it-anyway-chocolate. I might try that. I am so happy to see you. I was just wondering when you’ll be stopping by and here we are now, at least you had a banana-chocolate-chip scone (without ‘white chocolate’) so it was close to what I had for breakfast, but not not exactly the same.You have to try it “with white-I-know-its-not-really-chocolate-but-I-Really-don’t-care-Im-using-it-anyway-chocolate”. 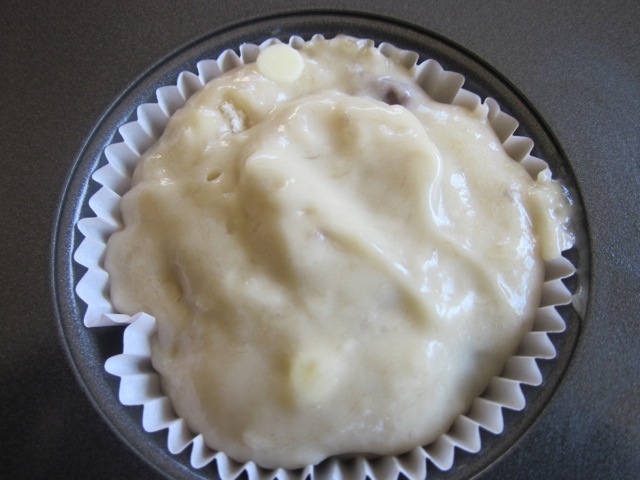 Try making the muffins with the “white chocolate” in your shallow clay dishes and let me know the outcome, it tastes so good. Have a fantabulous weekend and thanks for being my friend and for always making me lol or smile, too broadly. Sends a hug … just because. Okay hug received in one piece, and bounced off with two hugs…thank you. Enjoy your Sunday. These muffins just have to be good, Liz. They’ve got both banana and chocolate in ’em. Having one still warm from the oven must be too good for words. Thanks for sharing. I have just been reading the detailed wonton wrapper instructions, thanks for that. The muffins are very good. One of my favourites, and my children and their friends in school love them too, so I treasure them. Thanks so much for stopping by. Your presence here is most appreciated. Wish you a wonderful weekend. These photos are so good, I felt I could pick one off the plate! Fancy one right now with a cup of Earl Grey – and if possible I would like to snaffle a few away to take to work tomorrow! It’s nice to see you, sorry I have been moving at a snail pace and haven’t visited your blog for sometime but you know “From Alfredo’s with Love” is one of my favourite hang outs! Ha ha I had a warm muffin, with the chocolate melting inside, for breakfast, with some coffee. I needed to wake up after posting so late last night. 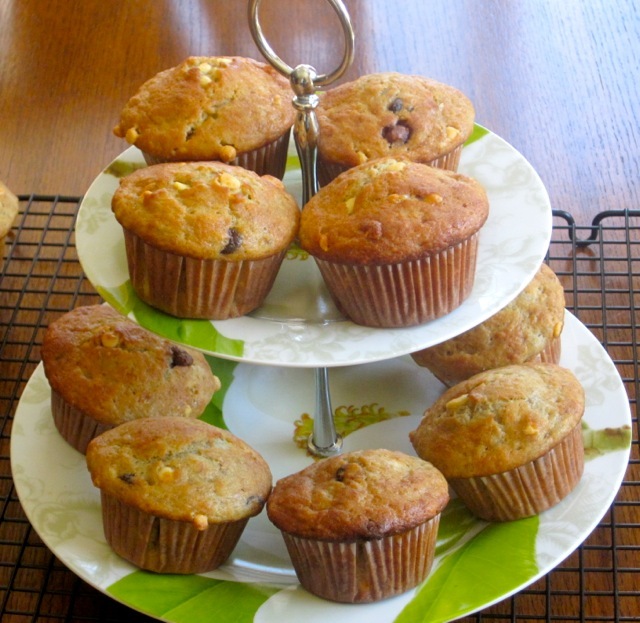 I wish I could mail you some muffins…they are so nice, easy to make and a great way to dispose off overripe bananas that would otherwise go down the drain. Bananas are also great for pancakes!!! Have a fantastic weekend and look forward to your visits in future. Cheers! Hey Liz! thanks for stopping by knowgluten. Your muffins look great! I definitely need to incorporate more white chocolate in my baking. And buttermilk. Yum! Thanks for stopping by, thanks for the compliments. I love white-dark-chocolate combo, it really tastes nice. I have just been looking at the grilled veggies with chicken. Quick and easy meal. Have a wonderful weekend! I love buttermilk in muffins! These look so luscious. I have become a devoted user of buttermilk. It really makes a difference to baking. I now wonder how I used to survive without it and yet I only discovered it two months ago. Thanks for stopping by. Have an amazing weekend. Hope to see more of you in future!!! It’s so nice to see you again. I really wonder what the countries that don’t consider ‘white chocolate’ a chocolate cal it…whities is a good one, perhaps I should also use that one. What would I call white brownies, I guess whities is a good substitute. Thanks for stopping by, have a wonderful weekend, I am sure your weekend has not ended!!! Ah, It is going to be Saturday in a few minutes, here in Indonesia. Thank you so much Hari, I appreciate that you always make a stop here and always leave me a happy note. Enjoy the market day. I envy you, the avocados in Canada don’t taste as nice as the ones in the tropics. Do you ever make avocado juice with lemon or lime? It’s really nice. Hope to see more of you in future! or should I call it avocado smoothie??? Seriously, you should try it. blend the avocado with lemon or lime, add some sugar or honey if you want, chill it or add some ice to it. It tastes awesome. I have had this juice several times when I travel to the tropics (they don’t call it smoothie, they call it juice). I don’t know what time it’s in Indonesia right now but enjoy the rest of your night I presume. I am going to try the avocado tomorrow. I happen to have common lime, mountain lime and kaffir lime at home. I’m going to try them all and see which one suits avocado best. Thank you so much Hari, you seem to love going to the market. I love markets too, especially the tropical ones, they are usually so interesting and full of varieties of goods. I love rattan and bamboo furniture. Best wishes and enjoy the market day. I’m not a fan of white chocolate in general, however, I had a new-found appreciation of it when I had it paired it with dark chocolate ice cream or black raspberry ice cream as well as in these absurdly delicious blondies that my friend’s wife makes. Sometimes that odd creaminess offsets bitterness or tartness and works just right. A combo of chocolate and white chocolate like you have here is also a great idea. Looks wonderful! I absolutely love the mixture or white and dark chocolate, mixed with banana in this recipe. it just makes a huge difference to the taste. I don’t like either on its own, but the combination is just awesome. I am glad there is someone out there who also loves and appreciates this combination. I would love to try the dark chocolate ice cream paired with white, I am sure it tastes absolutely gorgeous. Thanks for stopping by, thanks for joining the conversation and have a wonderful weekend. Hope to see more of you in future. 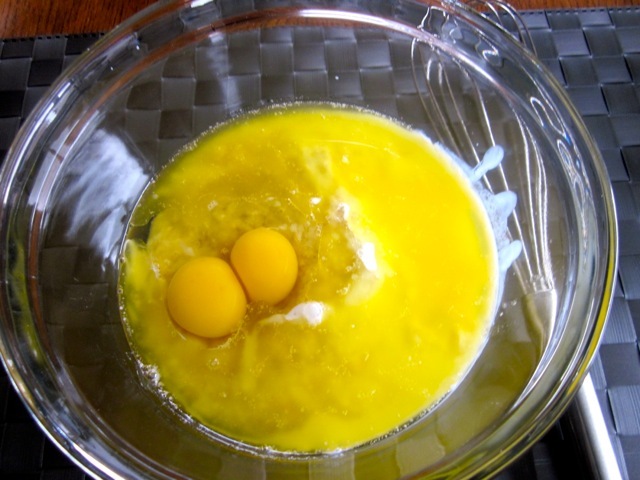 You have an interesting blog, but I love the recipe of the day section. Thank you for the compliments and have an amazing weekend. Hope to see you in future! These look delicious…. I love the beautiful golden color, too! Yum!! Thanks for stopping by. They are yummy, I love them. Have a wonderful weekend! 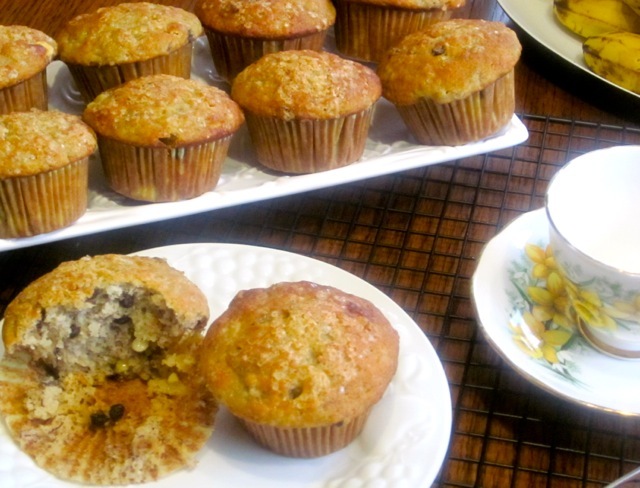 These muffins are delicious and easy to make. Ready in minutes, light and fluffy, dark verses white chocolate. I love them. Had one for breakfast this morning with some coffee. Thank you for stopping by and look forward to seeing you again! These look really tasty! Cute cake stand as well.